A “Bleed” is when the picture, color or other graphic extends 1/8″ (.125″) beyond the trim edge of the paper. That excess image or color is then CUT OFF to give the piece a clean edge. If you don’t include a bleed, your piece could have white paper appearing on the edge after the piece is trimmed. This happens because the paper could shift slightly during the trimming process. 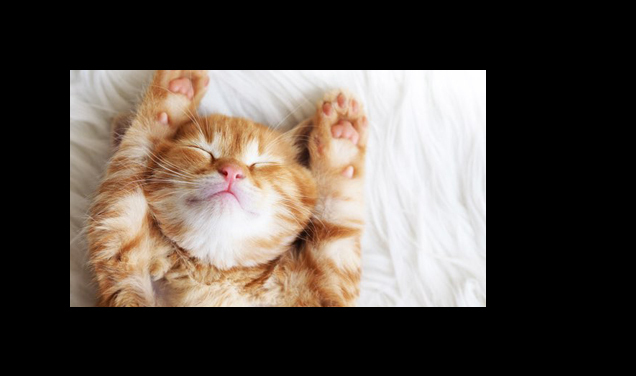 See the white paper peeking out around the left side and bottom of the image of the kitty? This is what happens if you don’t “Bleed” your images and colors properly in your document. 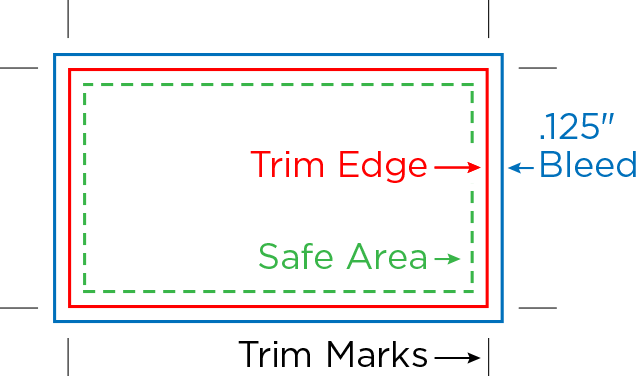 Text or images that are not meant to be trimmed off the edge of your final printed piece must be 1/8″-1/4″ (.125″-.25″) from the edge of your layout (also known as Safety or Safe Area). Items placed 1/8″ (.125″) or closer are in danger of being trimmed off or showing inconsistent margins. In the example below, you have a standard 3.5″ x 2″ business card, the final artwork provided to us needs to have a background size of 3.75″ x 2.25″ (.125″ on all sides) — the added .125″ is the bleed. The bleed area (shown in blue) extends .125″ beyond the trim edge of the page (show in red). 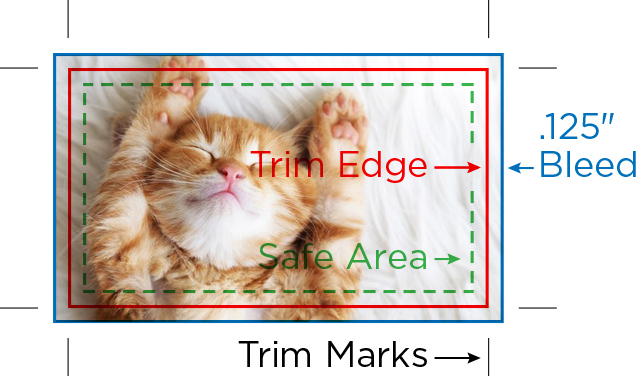 The trim edge is the final trimmed size of your printed piece. The safe area (show in green) is an example of the area in which you need to keep all important text and artwork that you do not want to have cut off. Remember, if you want something to bleed it must extend 1/8″ (.125″) beyond the final trim edge of the page. Enter the FULL BLEED dimensions. That is, 1/4″ extra both vertically and horizontally. Accent Printing and Copy Center will accept your digital files for printing. Given the wide variety of software packages, not to mention the settings within those packages, not all files are “print worthy”. We do not mean your design is not good, we are talking about the ability or inability of some software programs to output suitable printing files. Our staff is available to assist you in preparing your files properly so we can meet your deadline, quality requirements and budget needs. Word and Excel documents cannot be color separated from within the application. They are fine for digital composite prints in color or black and white and for single color printing on our press. A color shift will occur when printing these files in color, due to the fact that they only use RGB color (except Publisher) and we use CMYK for composite output. These files usually change line breaks and fonts when moving them from one computer to another, therefore a print from your computer is necessary for us to use for comparison. If you plan to use Publisher, Word or Excel, please call us BEFORE you start your project. Some files may need to be provided to us using the utilities within the application for preparation for a printer. Please contact us BEFORE you send or bring your files to us. All graphics that have been placed or inserted into your document must be included with the document you need printed. Full color images and photos that are to be printed in 4 color process need to be in CMYK color, not RGB. Spot colors need to be set as PMS colors. Be sure to only use 1 type of PMS color in your document. If, for example, you choose PMS185 from the coated color chart in one area of your document and PMS185 from the uncoated color chart in another area, they will separate as 2 different colors. It doesn’t matter to us which 1 you use, just be sure to use only 1. The difference between coated and uncoated relates to the type of paper that will be used for your project. The coated color charts will look more vibrant on your screen and will also look more vibrant when used on a coated paper. If you have been looking at the coated color charts on your screen and choose an uncoated paper to have your project printed on, you will see a dramatic difference in the color. If you are unsure about saving your project correctly, please feel free to contact us at 254-776-8805. Files that are too large to email as an attachment may be uploaded to our FTP site. If you are providing files to us on CD and bringing the materials by the shop, please have the following information (File Checklist) available when you arrive. Are photos and images included separately from your document? Are full color photos and graphics in CMYK color? Are fonts included with your document? Hard copy of document provided? List of files to use.